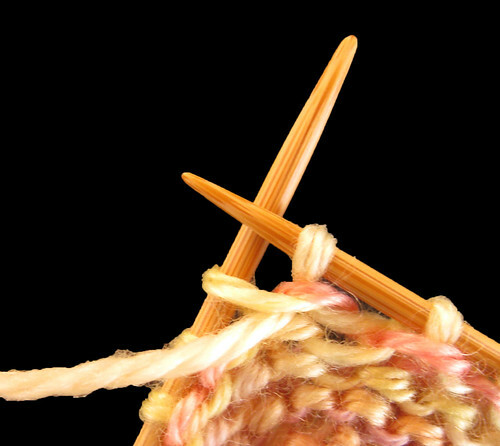 Although this is primarily a knitting blog, every so often I wander off into other, less fibery, topics. And today, I am going to editorialize a bit about citizenship--a subject that gets a fair amount of babble, but most people probably have no idea what being a US citizen really entails. Yes, you can vote at a certain age. Yes, you can earn money and collect Social Security in some cases. Yup, you can serve in the Armed Forces if you wish. But there is one, single inviolate privilege that US citizenship confers, and I would be willing to bet that few of you can name it. But you will, of course, by the time you finish reading this post, and it may help you in dire circumstances at some point in your life. I took a short international trip last week, which was unremarkable and not worth even mentioning, except for the part where I deplaned at a United States airport and queued up for immigration. For those US citizens who have never re-entered the country, suffice it to say that it invariably entails briefly standing on line, having your passport stamped, and then zipping off to another destination. This time, however, when I disembarked, the immigration hall was filled with people--sitting, standing, lying down--hundreds and hundreds of people, waiting in eerie silence. The lines stretched out of the hall, around corners, and, for all I know, back into jetways, stairs, elevators, and rooftops. No lines moved towards the dozen or so immigration booths. The only noticeable movement was the arrival of yet more deplaned passengers squeezing into a space that bore an uncanny resemblance to a gigantic Tokyo subway car at rush hour. After a few minutes, I queried an airport supervisor as to the problem, and was told that the relevant immigration computers were down, nationwide, and had been in this sad state for about six hours. He had no idea when the network would come back online, and until that happened, the static occupants of the immigration hall would not be allowed to pass over the magic yellow line onto US soil. Now, people who know me well would imagine that I would pull out a book and immerse myself in the written word until the situation resolved itself. But it seemed to me that this logjam was just plain wrong on many levels. We pay the salaries of the people manning those booths. More importantly, we do have real, unassailable rights under the Constitution, although we have lately been giving them away with depressing regularity. The history of the United States rarely portrays the citizenry as a nation of sheep. But when I looked around, I could see a vast assembly of ovines, waiting immobile for orders from Governmental Shepherds. After a few minutes of cogitation, I pulled out my blue US passport, waved it over my head, and opened my Big Mouth. "Excuse me, but I am a citizen of the United States. Under no circumstances may I be forbidden entry to this country while I carry a valid passport. In fact, the US cannot turn any US citizen away, regardless of what might happen once that person touches US soil. This Blue Sucker (fleegle waves passport again) entitles me to cross that yellow line, no questions asked." You could have heard an ant sneeze in the silence. The officers manning the immigration stations stared at me in astonishment--a two-legged sheep bleating constitutional truisms--something that these government workers had clearly never before encountered. "All people possessing Blue Suckers over here." He pointed to four of the booths. And with that, everyone bearing a US Blue Sucker speedily proceeded through the booths, the immigration officers' stamps thumping away in triple time. I doubt that I will ever again receive a round of applause from hundreds of exasperated passengers, complete with dozens of pats on the back, a few wolf whistles, and many, many smiles. The airport supervisor asked me if I was going to run for Congress. Someone else asked if I was in immigration attorney. Several people shook my hand. On the down side, I suspect that citizens of other countries sporting Green, Red, and Purple Suckers are still milling about the hall, waiting for the IT geniuses in Washington to figure out who pulled what plug on which database. I can't speak for other countries, but in the United States, the only perquisite of citizenship is that you must be admitted if you can show such proof. It might be that you are arrested the moment you step on US soil, but you may not be denied entry, no matter what. The moral of this little story is that sometimes, you can confront Homeland Security, and sometimes you can actually win. Speak up. Know your rights. Welcome home. Well, I was certainly pleasantly surprised by the response to my last blog. I figured about six people might want me to keep babbling about spinning, but there apparently are quite a few who enjoy the postings, so of course, I shall continue. As every blogger knows, feedback keeps us going. The last spinning post had four comments, so I figured that either (a) Harry was deleting posts just to be annoying or (b) everyone's head hit the keyboard in stupefaction when they saw Yet Another Spinning Post. Clearly, the answer is (c). The pattern is mildly tricky, but once you've run through one repeat, it's a no-brainer. Please swatch carefully, though. 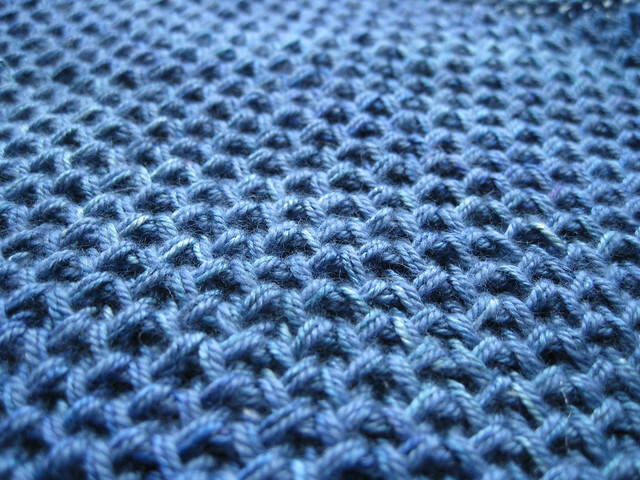 Brioche patterns are incredibly stretchy--you'll need a lot fewer stitches than you could possibly imagine. 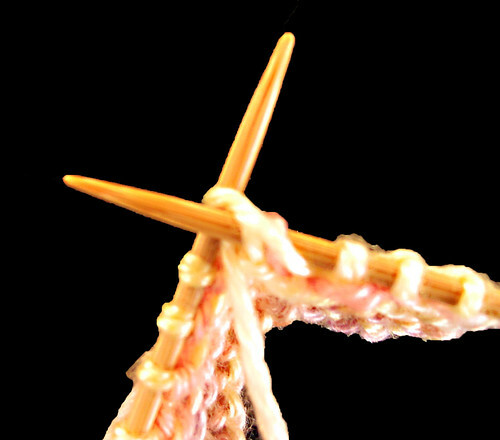 Cast on an even number of stitches. Row 4: P1, Purl the next stitch with the slipped thread of the previous row, as shown below. 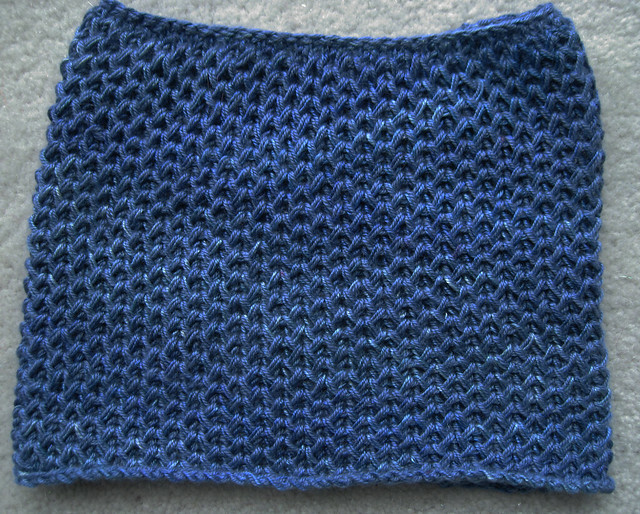 I realize that this pattern could be done by slipping stitches instead of knitting in the stitch below. 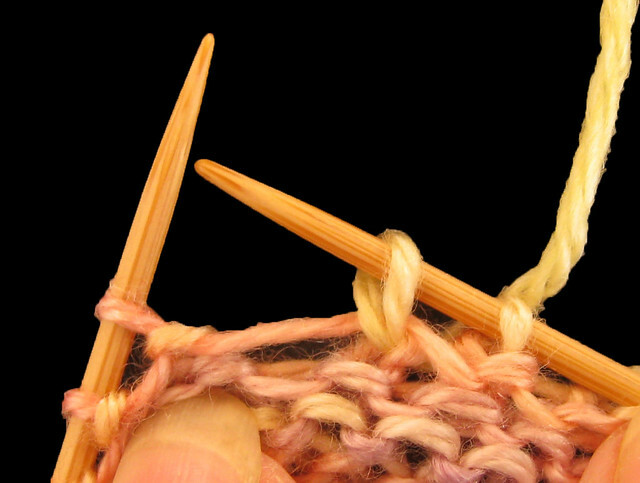 Many Brioche stitches are written using slips instead of belows. Try it both ways and see which one you prefer. Next time, Harry will post about his exciting goat-herding class that he took in Albania, followed by a slide show of his whirlwind tour of Krasnoarmeisk, Myshkin, Putchezh, Kholui, Urupinsk, Mariinsky Posad, Kirillov, Suzdal and Gus-Krustalnyi. Here ends my 300th post, and I want to thank all my readers from the bottom of my heart for your support and comments. Harry doesn't have a heart, but he thanks you from the bottom of his purple iPod for electing him Ruler of the Known Universe. Did you guys really do that?